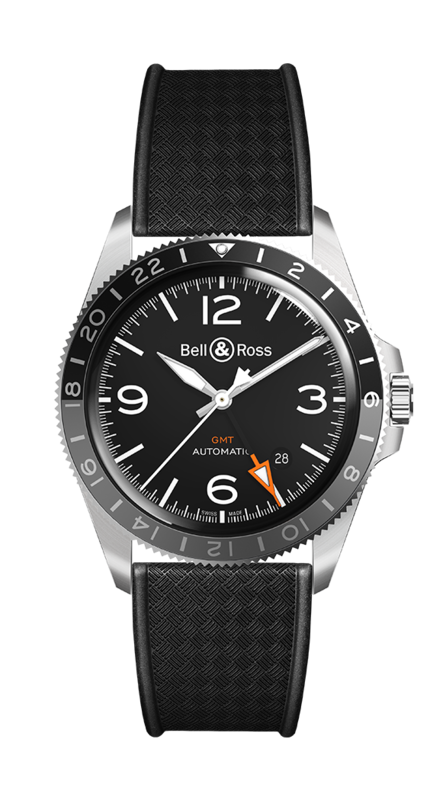 In my endless quest to get geeks interested in watches I present to you the Bell & Ross BR V2-93 GMT 24H, a new GMT watch from one of my favorite manufacturers that is a great departure from the company’s traditional designs. The watch is a 41mm round GMT, which means it has three hands to show the time in the 12-hour scale and another separate hand that shows the time in a 24-hour scale. You can use it to see time zones in two or even three places and it comes in a nice satin-brushed metal case with a rubber or metal strap. B&R is unique because it’s one of the first companies to embrace online sales after selling primarily in watch stores for about a decade. This means the watches are slightly cheaper — this one is $3,500 — and jewelers can’t really jack up the prices in stores. Further, B&R has a great legacy of making legible, usable watches, and this one is no exception. It is also a fascinating addition to the line. B&R has an Instrument series, which consists of large, square watches with huge numerals, and a Vintage series that hearkens back to WWII-inspired, smaller watches. This one sits firmly in the middle, taking on the clear lines of the Instrument inside a more vintage case. Ultimately watches like this one are nice tool watches — designed for legibility and usability above fashion. It’s a nice addition to the line and looks like something a proper geek could wear in lieu of Apple Watches and other nerd jewelry. Here’s hoping.